The index opened huge gap-up on the back of ECB QE and went on to make a high of 8866 within the first few minutes of trade. Profit booking saw the index dip below 8800 but closed higher at 8835.60, gain of 74.20 points. The broader market though was negative, with 524 advances to 1021 declines. 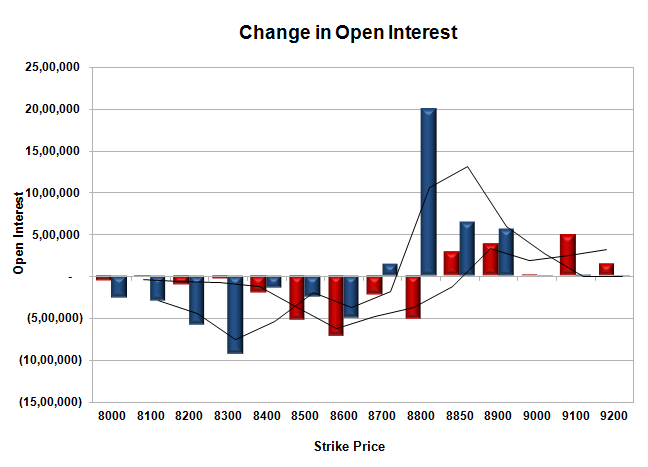 The range as per OI Table is 8500-9000 till Expiry. 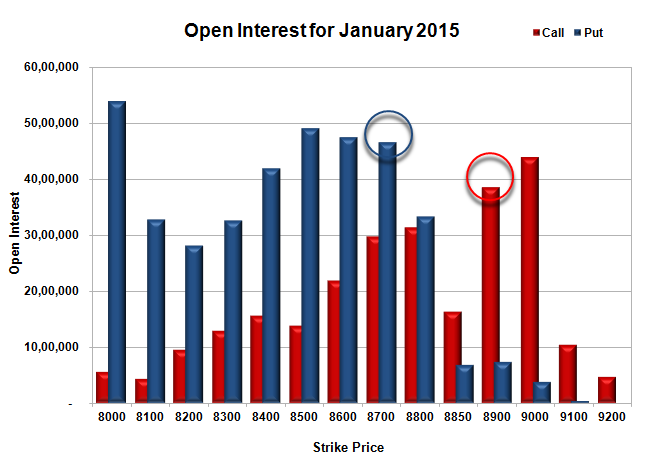 Call option 8850-9200 added huge 13.16 lacs OI with short covering seen at 8700 and lower strike prices. Put option 8900-8700 added huge 33.44 lacs OI with profit booking seen at 8600 and lower strike prices. Nifty Open Interest is at 2,26,54,775 up by 98,575, whereas Feb series also added 10.75 lacs, with increase in price, most probably huge long build-up. Bank Nifty Open Interest is at 18,94,925 down by 64,375, whereas Feb series added 3.09 lacs with increase in price, most probably 100% roll-over with huge long build-up. FII’s bought huge 14.35 lacs Futures, which includes 61062 contracts long build-up and 3646 contracts short build-up, with increase in net OI by 64708 contracts (includes 123791 longs to 66375 shorts for the day) and the Average Price comes to 9216.08. FII’s Index future open contract as on date is 845224 Longs to 124952 Shorts, net long 720272 up by huge 57416 contracts. Initial and very good support now at 8800, with huge OI addition of 19.98 lacs and below that at 8700 with OI of 46.52 lacs. Initial resistance not at 8900, with OI of 38.63 lacs and above that at 9000 with OI of 43.99 lacs. 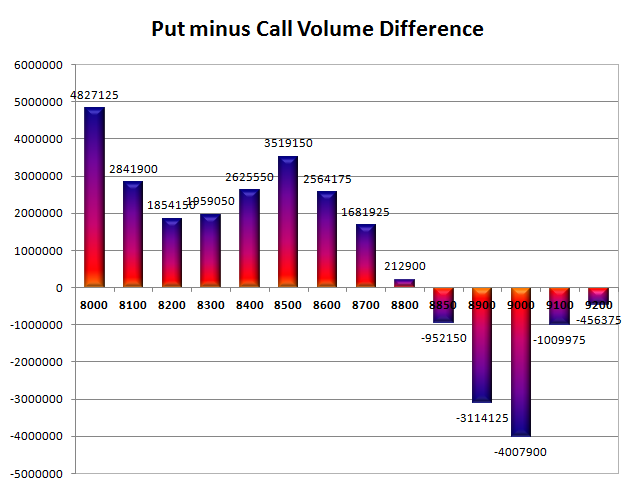 Day Range as per Option Table is 8760 - 8905 and as per VIX is 8750 - 8921 with 8832 as the Pivot.